The Magick Moon Collection celebrates the important place the moon occupies in Pagan and Wiccan rituals. The Magick Moon Silver Bangle Bracelet is an enchanting reminder of the moons power, beauty, and connection to our lives. 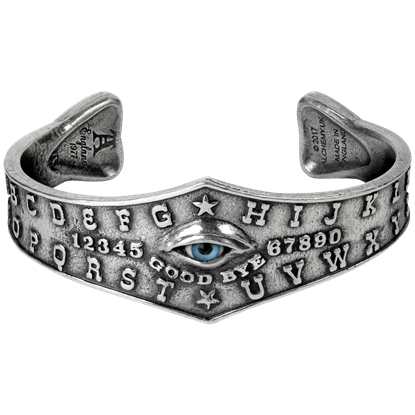 The gift of foresight and clairvoyant abilities are not necessary to recognize the chic style of the Ouija Eye Bangle. A mystical aura surrounds this jewelry piece, making it the perfect accessory for the fashion savvy fortuneteller. 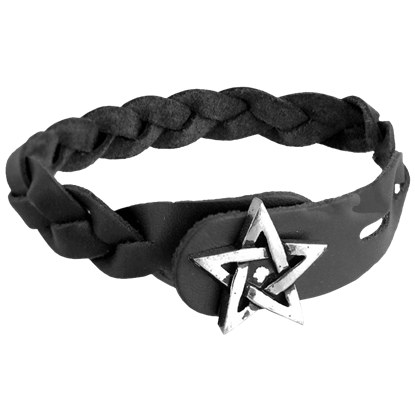 The Pentagram Gaelic Plait Leather Bracelet is a hand plaited, black leather wristband with pewter pentagram button fastening. The Pentagram Gaelic Plait Leather Bracelet makes a great gothic bracelet for everyday use. 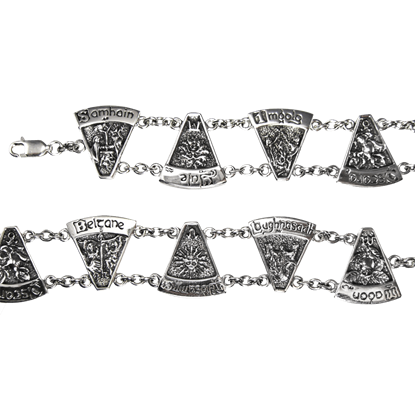 This Silver Heart Pentacle Bracelet is a merger of icons, and while each one is individually symbolic, they form a greater whole that is not just appealing to the eye, but also possessed of a combined greater meaning. Intricate detailing is one of the hallmarks of this accessory. 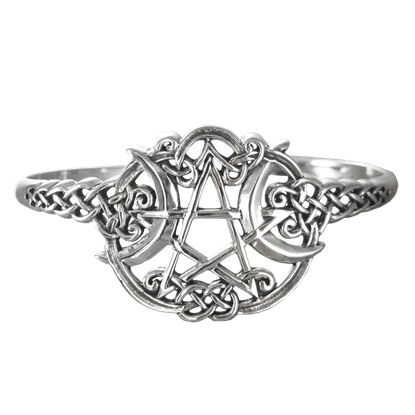 The Silver Raven Pentacle Bracelet is a beauteous little item that merges the mystic qualities of the raven with the pentagram, creating a truly attractive accent to wear. 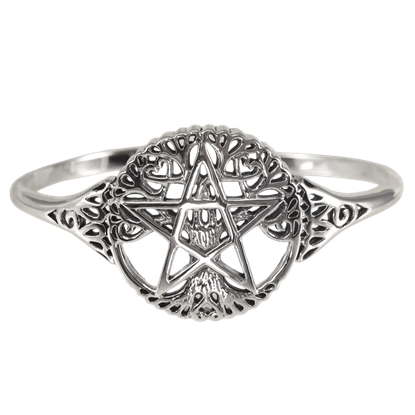 If the tree of life is symbolic of all life in the world and the pentagram is symbolic of spiritual strength, then this Silver Tree Pentacle Bracelet must be symbolic of a meeting between the physical world, and the spiritual world. Laid out into eight triangular sections, the Pagan Wheel of the Year is here revealed in intricate and inspired detail. 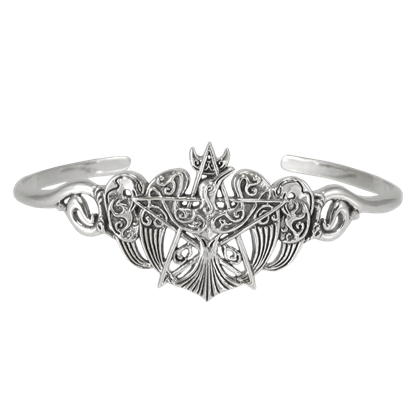 The Sterling Silver Wheel of the Year Bracelet is a remarkable Wiccan accessory made of solid, shining silver. The moon has been the constant companion of Earth for eons, sharing its heavenly inspiration with every inhabitant of the planet. 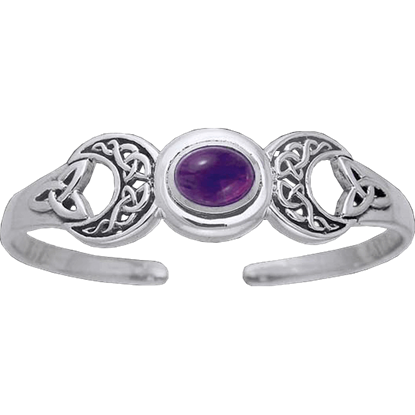 The White Bronze Magic Moon Cuff Bracelet shows off a gemstone in the center of knotwork moons.